The Boltax (ボルタックス) is a Japanese camera taking 25×25mm pictures on Bolta film, made from 1938 by Miyagawa Seisakusho, the maker of the 3×4 Picny, and distributed by Mitsukoshi and by Yamashita Yūjirō Shōten. The German company Bolta-Werk released the Boltavit camera in 1936, soon renamed Photavit, using paper-backed unperforated 35mm film wound on specific spools. Miyagawa released the Boltax around this film type two years later. This would be the origin of the success of Bolta film in Japan, which would last until well after the war. The name "Boltax" was obviously forged after "Bolta" and "Contax". The Boltax uses some of the solutions already adopted by Miyagawa on the Picny. The body is made out of a metal tube (like the body of the Leica screw models up to the IIIb). The dimensions are 7.8×4.3×2.3cm. The lens and shutter assembly is mounted on a collapsible helical, which is also used for focusing. The distance scale is engraved in metres down to 2/3m. On all the Boltax models, the lens is a Picner Anastigmat 40mm f/4.5 with no serial number, the shutter speeds are B, 25, 50, 100, the shutter is wound by a lever on one side and tripped by another lever on the opposite side. The Picner lens has three elemnts and was made by Fujita. The shutter was called "Picny" and made by Miyagawa itself. The torpedo-shaped optical finder is offset to the right, as seen by the photographer. The film is advanced by a knob at the top left, surrounded by a manual frame counter: the user has to stop winding when the next frame number is facing an index. The top plate is removed for film loading, and is locked in place by a key offset to the left, with O and L indications (for Open and Locked). The back has a door hinged to the left, showing the exposure chamber and supporting the pressure plate. It makes film loading easier and allows to set the position of the first exposure, before setting the frame counter to 1. The bottom plate is attached to the body by four screws, has a tripod thread and two film flanges; the serial number is engraved on the film flange of the supply side. The name Boltax is embossed in the leather on the front side and on the rear door. The original Boltax, called Boltax I in retrospect, has nickel-plated metal parts. The frame counter, aperture scale and shutter plate are black with silver markings. The speeds are selected by turning the shutter rim, and the scale is inscribed on the shutter plate in the order 100, 50, 25, B. There are silver stripes on both sides of the lens, and the name PICNY D at the bottom is certainly the shutter name. The serial number at the bottom is inscribed as NO.xxxx on the early cameras, and as N°xxxx on later ones. Observed body numbers range from 1983 to 5401. It is not known if the number sequence was shared with the Picny or not. The original Boltax was advertised in Japanese magazines from August 1938. It appears as a new model in an advertisement dated October 1938 by the Mitsukoshi department store. The picture shows the camera sitting over a cigarette pack, emphasizing its small size. The camera is priced at ¥39 and one roll of 12 exposures costs ¥0.85. 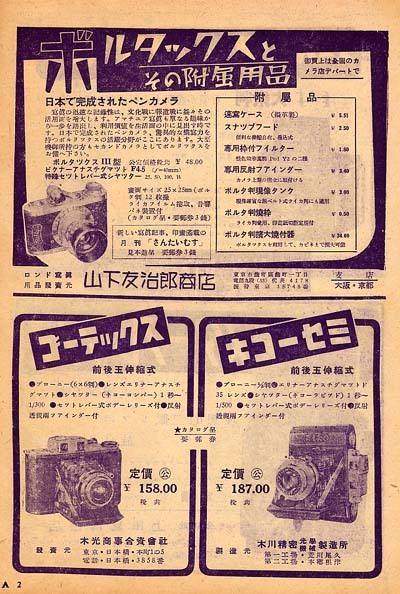 Advertisements dated January 1939 give the same price for the camera and film roll, and list various accessories: ever-ready case (¥5), filter (¥1.60) and lens hood (¥0.70). The advertisement in Asahi Camera, placed by Yamashita Yūjirō Shōten, makes constant reference to the Leica, and says that Yoshikawa Hayao recommends the camera with those words: "when put side by side with a Leica, they look like father and child". It also says that the camera can take regular 35mm film. It is certainly possible to spool perforated 35mm film onto Bolta spools and to load the camera in a darkroom, but this is probably inconvenient, and the frame counter perhaps gives wrong indications because of the different thickness of the film without the paper backing. The reflex finder has a square shape, a square eyepiece and a fixed round baseplate. To attach the finder, it seems that the film flange at the right end of the top plate is removed and replaced by the round baseplate. An example of the Boltax I with the attached reflex finder is pictured here and here by Hiroyuki Hatano. an accessory shoe is added to attach an accessory reflex finder. The picture shows a camera with an attached lens hood. The shutter speeds are directly inscribed on the moving rim, in the order 100, 50, 25, B. The price of ¥47 perhaps includes the "snap hood". The new type of reflex finder has a cylindrical shape and a round eyepiece. It comes in a jewel case marked Boltax on the lid. An advertisement dated September 1940 shows another picture of the camera with a lens hood and an accessory shoe, certainly corresponding to the Boltax II, but the camera name is given as "Boltax" with no model number. The only body number confirmed for the Boltax II is 8561, pictured in this page. The actual examples have the additional accessory shoe at the right end of the top plate, and have a nickel-plated frame counter, aperture and speed scale. The speeds are engraved at the top of the shutter rim, which also has the name BOLTAX II at the bottom, and there is no more mention of the "Picny D" shutter name. It is not known if the cameras actually have the internal click spring or not. The "snap hood" announced in the advertisements is a telescopic device, perhaps made of rubber, with a chrome metal rim and an attached yellow filter. At least one example of the Boltax II is known to have the speeds engraved in the order 100, 50, 25, B on the moving rim, as on the advertising picture cited above. This is incompatible with the mechanism of the original Boltax, and indicates that the internals were altered. Other examples have the speeds engraved in the reverse order B, 25, 50, 100, perhaps indicating that the internal modifications were cancelled (the same configuration continued on the Boltax III). The nickel-plated Boltax III shows no difference from the Boltax II, other than the name BOLTAX III engraved at the bottom of the speed rim. The reason for the name change is completely unknown. All the examples known so far have speeds in the order B, 25, 50, 100. The late examples of the Boltax III have chrome-plated metal parts, and transitional examples are known with chrome plating on the major parts and nickel plating on some smaller ones. The newer reflex finder has been observed so far with chrome plating only. One example of a tele conversion lens is pictured in this page of the AJCC, where it is described as a prototype which was not commercially released. The official list of set prices compiled in October 1940 and published in January 1941 has three models of the Boltax, all at ¥41: the "Boltax I", "Boltax III" and "Boltax F". No further detail is given, and the Boltax F is otherwise unknown. The Boltax III was advertised in Japanese magazines from December 1940. The January 1941 advertisement in Asahi Camera mentions the click spring for perforated 35mm film. The October 1941 advertisement in Shashin Bunka gives the price of ¥41, and advertisements dated January 1942 in Hōdō Shashin and Shashin Bunka give the price of ¥48. Another advertisement, dated about the same, adds a Bolta enlarger to the list of accessories. The April 1943 government inquiry on Japanese camera production still has the Boltax, and the last reported advertisement for the Boltax III is dated May 1943. Serial numbers are known in the 10xxx to 11xxx and 13xxx to 16xxx range on nickel-plated Boltax III, and in the 18xxx and 20xxx range on chrome-plated cameras. One chrome-plated camera with serial number in the 19xxx range has a nickel-plated shutter casing with BOLTAX II engraving, certainly because the part was replaced and interchanged with another camera. Various rangefinder conversions were offered by Japanese workshops. An advertisement in Shashin Bunka February 1943 presents a coupled-rangefinder conversion for the Boltax, taking 20 days and costing ¥40. The picture shows a converted Boltax, with a combined range and view-finder contained in a casing covering the top plate to the right of the advance knob. The coupling mechanism and the film loading method are unknown. The top plate is perhaps removable, but no locking key is visible. There are screws on the bottom plate, which is certainly fixed. The advertisement shows the words Kōgaku Kikai Shūribu, meaning "Optical and Mechanical Repair Department", and an address in Tokyo, Itabashi. It also mentions conversions for the Leotax and Canon. 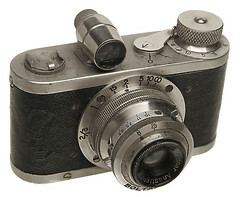 The Cyclon coupled rangefinder conversion, offered in 1943 and 1944 for the Gelto and other 3×4 and 4×4 cameras, was also available for the Boltax. The conversion, done by Sugaya Kōki Seisakusho and distributed by Sankōsha and Matsuzaki Shashinki-ten, is described in detail in this section of the Gelto page. It was cheaper for the Boltax than for other models, costing ¥40 in October 1943 and ¥67.50 in May 1944. One example of the Boltax is pictured in Sugiyama as the "Boltax IV", and is also featured in an issue of Camera Collectors' News. The name "Boltax IV" was invented for Sugiyama's book, and it is certainly wrong. The camera has a fixed top plate and a removable bottom plate. The back door is hinged to the right, indicating that the main body was simply reversed. The bottom plate is similar to the top plate of the other Boltax, with the same type of locking key, and a tripod thread at the location of the tubular finder. It has no film flange and no serial number is visible. The top plate has an advance knob at the left end, placed above a small cylindrical stand. The advance knob has frame numbers engraved on its conical base. The rest of the top plate is covered by a metal housing, containing an optical finder offset to the right and an auto-stop advance mechanism. There is a small lever at the rear, certainly used to unlock the film advance after each exposure. The lens and shutter are the same as on the Boltax I, with the black shutter plate and PICNY D marking, but the aperture scale is silver with black engravings, as on the Boltax II and III. The leather covering has no Boltax embossing, and the back door is painted black with no covering at all. The camera is presented as a prototype by Miyagawa in the article by Yazawa in Camera Collectors' News, but another plausible theory is that this is a Boltax I converted with auto-stop advance by an unknown workshop. After the war, the Boltax was succeeded by the Dan 35, perhaps made by Yamato, and by the Silver. The company Miyagawa either survived the war or was reformed after some years, and made the Picny B and a Picny rangefinder model, evolutions of the Boltax. ↑ Recent sources often say 24×24mm, but the advertisements say 25×25mm, which was the official picture size of the Boltax: advertisements dated January 1939, August 1940 and January 1942 reproduced in Kokusan kamera no rekishi, pp.89 and 92–3, and advertisement in Asahi Graph, September 4, 1940, formerly reproduced at Gochamaze (archived). ↑ Advertisement in Asahi Graph, October 5, 1938, formerly reproduced at Gochamaze (archived). ↑ "Kokusan shashinki no genjōchōsa" ("Inquiry into Japanese cameras"), lens item I5. ↑ "Kokusan shashinki no genjōchōsa" ("Inquiry into Japanese cameras"), shutter item 12-V-3. ↑ Kokusan kamera no rekishi, p.341. ↑ Advertisement in Asahi Camera January 1939, reproduced in Kokusan kamera no rekishi, p.92, and advertisement in Asahi Graph, January 18, 1939, formerly reproduced at Gochamaze (archived). ↑ Advertisement in Asahi Camera November 1939, reproduced in Kokusan kamera no rekishi, p.92. Advertisement on p.26 of Nihon Shashin Kōgyō Tsūshin, December 15, 1939, reproduced on p.60 of Hyaku-gō goto jūkai no kiroku. ↑ Round baseplate: picture of the November 1939 advertisement reproduced in Kokusan kamera no rekishi, p.92. ↑ Advertisement reproduced in Kokusan kamera no rekishi, p.93. ↑ Example observed on a Boltax III in an online auction. ↑ Example pictured in "Boruta-han kamera no subete", p.91 of Kurashikku Kamera Senka no.21. ↑ Advertisement in Asahi Graph, September 4, 1940, formerly reproduced at Gochamaze (archived). ↑ Takesaki, p.95 of Kurashikku Kamera Senka no.21, says that the distinguishing feature of the Boltax III is the addition of the click spring. This may imply that the Boltax II shown in the article does not have this feature, or this may be a mistake. ↑ Example pictured in this page at submin.com. ↑ Example pictured in this page at pbase. ↑ Examples pictured in this page and in Sugiyama, item 4108. ↑ This is confirmed by Awano on p.23 of Camera Collectors' News no.251. ↑ "Kokusan shashinki no kōtei kakaku", type 5, section 6B. ↑ Advertisements reproduced in Kokusan kamera no rekishi, pp.89, 93 and 106. ↑ Advertisement reproduced in Nostalgic Camera by Toshio Inamura. ↑ "Kokusan shashinki no genjōchōsa" ("Inquiry into Japanese cameras"), item 182. ↑ Example with body no.19229, sold as lot no.465 of Westlicht Photographica Auction no.16 (linked below). ↑ Advertisement reproduced in Kokusan kamera no rekishi, p.110. ↑ The exact address is Tōkyō-to Itabashi-ku Itabashi-chō 2–370 (東京都板橋区板橋町二丁目三七〇). ↑ Advertisements dated October 1943 and May 1944 reproduced in Kokusan kamera no rekishi, pp.111–2. ↑ Sugiyama, item 4110, and Yazawa, pp.9–11 of Camera Collectors' News no.249. ↑ Yazawa, p.9 of Camera Collectors' News no.249, confirms that the name "Boltax IV" was invented. ↑ Auto-stop advance: Yazawa, p.9 of Camera Collectors' News no.249. Awano Mikio (粟野幹男). Answer to a letter by Morihara Hitoshi (森原仁). In Camera Collectors' News no.251 (May 1998). Nishinomiya: Camera Collectors News-sha. P.23. "Kokusan shashinki no genjōchōsa" (国産写真機ノ現状調査, Inquiry into Japanese cameras), listing Japanese camera production as of April 1943. Reproduced in Supuringu kamera de ikou: Zen 69 kishu no shōkai to tsukaikata (スプリングカメラでいこう: 全69機種の紹介と使い方, Let's try spring cameras: Presentation and use of 69 machines). Tokyo: Shashinkogyo Syuppan-sha, 2004. ISBN 4-87956-072-3. Pp.180–7. Item 182. "Kokusan shashinki no kōtei kakaku" (国産写真機の公定価格, Set prices of the Japanese cameras), listing Japanese camera production as of October 25, 1940 and setting the retail prices from December 10, 1940. Published in Asahi Camera January 1941 and reproduced in Shōwa 10—40nen kōkoku ni miru kokusan kamera no rekishi (昭和10〜40年広告にみる国産カメラの歴史, Japanese camera history as seen in advertisements, 1935—1965). Tokyo: Asahi Shinbunsha, 1994. ISBN 4-02-330312-7. Pp.108—9. Type 5, section 6B. Lewis, Gordon, ed. The History of the Japanese Camera. Rochester, N.Y.: George Eastman House, International Museum of Photography & Film, 1991. ISBN 0-935398-17-1 (paper), 0-935398-16-3 (hard). P.55. McKeown, James M. and Joan C. McKeown's Price Guide to Antique and Classic Cameras, 12th Edition, 2005-2006. USA, Centennial Photo Service, 2004. ISBN 0-931838-40-1 (hardcover). ISBN 0-931838-41-X (softcover). P.692. Nihon Shashin Kōgyō Tsūshin (日本写真興業通信). Hyaku-gō goto jūkai no kiroku (百号ごと十回の記録, Ten records, every hundred issues). Tokyo: Nihon Shashin Kōgyō Tsūshin Sha (日本写真興業通信社), 1967. No ISBN number. Advertisements on pp.54 and 60, corresponding to pp.20 and 26 of the December 15, 1939 issue. Sugiyama, Kōichi (杉山浩一); Naoi, Hiroaki (直井浩明); Bullock, John R. The Collector's Guide to Japanese Cameras. 国産カメラ図鑑 (Kokusan kamera zukan). Tokyo: Asahi Sonorama, 1985. ISBN 4-257-03187-5. Items 4107–10. Takesaki Harutoshi (竹崎春年). "Boruta-han kamera no subete [katarogu]" (ボルタ判カメラのすべて[カタログ], All Bolta-size cameras [catalogue]). In Kamera Rebyū: Kurashikku Kamera Senka (カメラレビュー クラシックカメラ専科) / Camera Review: All about Historical Cameras no.21, June 1992. No ISBN number. Kurashikku kamera daikenkyū (クラシックカメラ大研究, studies on classic cameras). Pp.95–105. Yazawa Seiichirō (矢沢征一郎). "Renzu no hanashi (159) Shisaku Borutakkusu" (レンズの話試作ボルタックス, Lens story  Boltax prototype). In Camera Collectors' News no.249 (March 1998). Nishinomiya: Camera Collectors News-sha. Pp.9–11. Boltax III, lot no.368 of Foto Hobby Rahn Photographica Auction no.5 (May 12, 2007). This page was last edited on 26 October 2018, at 05:28.